"A light and healthy sandwich on those days when you want something yummy, yet not really heavy. Perfect in the summertime with fresh garden-ripe tomatoes!" Spread mayonnaise on one side of both slices of toasted bread. 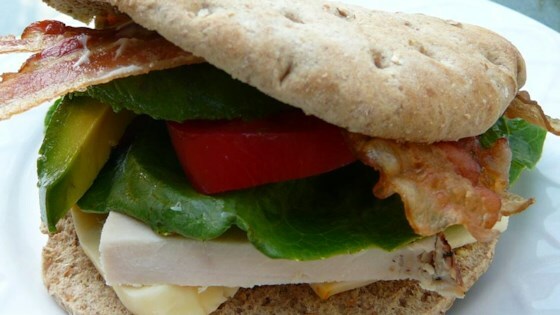 Top a bread slice with provolone cheese, turkey, bacon, avocado, tomato, and lettuce. Place the remaining bread slice on top, slice in half, and serve. A filling and unique breakfast delight! I've made this in place of a BLT for years. Try bacon, avocado, fried egg and fresh tomato if you want something really good! This sandwich is very very good - try serving it on a croissant to make it really special and perfect to serve at a luncheon. So, so good. I used low-carb bread and bibb lettuce. Most of the ingredients in this sandwich I found cheaply at my local discount grocery store, so I didn't break the bank. Very yum. Simple and fast. I spread the mayo on both pieces of bread and toast them oin a skillet. I add a little onion and use queso fresco instead of provolone. Makes a great sandwich! Very good. It is like a blt with avacodo on it. This is a very good sandwich. It's like a turkey club with avocados. I used sharp cheddar since thats what I had on hand. This was great for a quick dinner.